If you’ll be visiting a 6-8-month-old baby sometime soon and want to take along a small present, think about bringing something related to first foods. Most babies start eating solid food somewhere between four and seven months of age. And by “solid food” I mean smushed up bananas and avocados, not steak tartare. This is a big deal, this starting solids, but since the milestone falls between birth (new baby gear!) and baby’s first birthday (toys! ), chances are your friend/relative didn’t receive a lot of gifts to help around the kitchen. 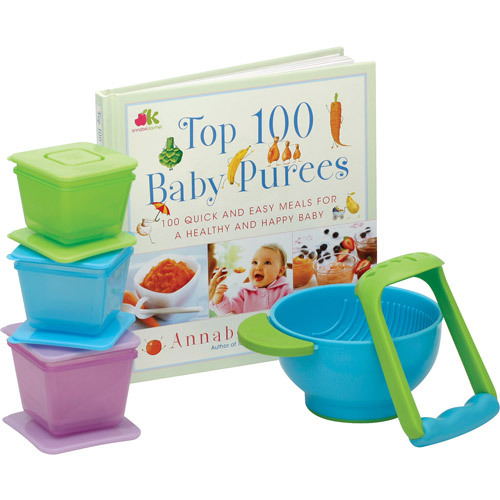 Even if s/he’s not a cook and feeds Junior mostly jarred baby food, this starter set of Annabel Karmel’s cookbook, 100 Best Baby Purees + a bowl and masher set + a few food containers will still be welcome and useful. I was not a cook when Astrid started solids and even I loved this cookbook: the food tastes better than a lot of things I’ve made for adults and most of the recipes have a manageable number of ingredients and steps (like, four). The bowl and masher are great for smashing soft veggies and fruits on the go (vs. finding a fork) and are durable and useable at the table (grippy bottom). And small, BPA-free, take-with-you food containers are always useful. They’ll thank you for it, trust me.